Tim Cook, Apple’s Chief Executive Officer, took an unusual step reassuring shareholders on Monday about its business in China. The statement came ahead of a 13% drop and rebound in stock of the iPhone maker. Sudden drop in the Chinese stock market and Beijing’s recent devaluation of yuan have shaken Apple investors that were already worried about slowing growth in the world’s No. 2 economy. Cook took a daring step by commenting on Apple’s business health midway through a financial quarter. Before the opening bell on Wall Street, Cook sent his response in an email saying that iPhone activations in China had accelerated over the past few weeks. Apple CEO Tim Cook encourages new graduates through his message on Sunday for this year's graduating class at George Washington University. He said they must understand that this is their world and they have the responsibility to change it. He also shared during his 20-minute speech personal stories about meeting Govs. George Wallace and Jimmy Carter as a teenager growing up in Alabama. He also talked about his first interaction in the late 1990s with Apple co-founder Steve Jobs and reading history books that didn’t discuss slavery's role in the Civil Ward. Cook said to the grads, “The world needs you in the arena. There are problems that need to be solved, injustices that need to be ended, people that are still being persecuted, diseases still in need of cure”. Technology major Apple is looking forward to use renewable energy to power its entire global business, including its supply chain. The company is also making initiatives to reduce its impact on paper, wood and similar fibers. Chief executive Tim Cook said, "Apple's goal is to achieve a net-zero impact on the world's supply of sustainable virgin fiber and power all its operations worldwide on 100 percent renewable energy". The firm already generates enough renewable energy to power 87% of energy use in its stores, offices and data centers excluding its supply chain. Apple said in a statement that its supply chain uses 60 times as much power as its own operations. During 'Imus in the Morning' show on Wednesday, commentator Bernard McGuirk called Apple CEO Tim Cook a 'bigot hypocrite'. He called cook so for 'running his mouth' about the new law. The show is broadcasted on Fox Business. On Friday, the American cable and satellite business news television channel has apologized for what its commentator had said earlier. According to reports, McGuirk called Cook a 'bigot' in response to Cook's column in the Washington Post where the Apple CEO admonished Indiana's religious freedom law. In the column, Cook has talked about other potential laws like Indiana's religious freedom law. iPhone and Mac giant Apple will be shortly added to the 30-stock Dow Jones Industrial Average index on March 19. The move will mean exit of AT&T from the index. In order to balance the impact of technology sector on the index, the Cupertino, California-based technology major Apple will be added. The 119-year old stock market barometer has been holding AT&T for almost 100 years. AT&T has been kicked out of the index a few times in the past as well. AT&T has not commented on the move announced by the index manager S&P. Dow Jones is currently hovering around its all time high and the current move to change AT&T by Apple won’t have a big impact on the index. Apple stock ended marginally higher at $126.6 on Friday. Washington, Feb 28 : Apple CEO Tim Cook has hinted at the possibility of Apple Watch replacing users' car keys. According to Tech Crunch, it's a powerful use case to propose because it's immediately apparent that if one already has an Apple Watch for the benefits of notifications and communication it offers, migrating the functions of other dedicated gadgets with similar radio and sensor loadouts to the wearable makes a ton of sense. Washington, Jan 23 - Apple CEO Tim Cook was paid 9.2 million dollars by the company in 2014 wherein 1.7 million dollars was paid as salary and 6.7 million dollars as non-equity compensation. According to TechCrunch, the amount of money Cook made in 2014 was double of what he made in 2013, which was roughly 4.2 million dollars. While Angela Ahrendts, hired away from Burberry to lead Apple's retail strategy, earned 73 million dollars and the vast majority of that was in stock. London, Oct 31- Apple chief executive Tim Cook has came out of the closet and announced that he is gay and a proud one at that. According to the BBC, Cook made his announcement to try to help people struggling with their identity, he wrote in a Bloomberg Businessweek article. Cook wrote that while he had never denied his sexuality, he hadn't publicly acknowledged it either, until now. He said that he was proud to be gay and considered it to be among the greatest gifts that God gave him. London, Sept 13 : Apple CEO, Tim Cook, has hinted that his company has not lost sight in the consumer durable segment of television. In an interview given to a television channel, Cook rued how television viewing was still stuck back in the 70s and that there was every possibility of missing a show, the Mashable reported. Apple Watchers believe that there could be one more product in the offing from the Apple stable before the end of 2014, which most likely include the iPad, but did not rule out an Apple TV update or even an all-new Apple Television set. Washington, Apr 24 : Apple CEO Tim Cook announced that the company has made 24 acquisitions in past 18 months. According to CNET, Cook said that Apple looks for companies with great people and technology that fits culturally, and they don't have a rule that says they can't spend a lot. 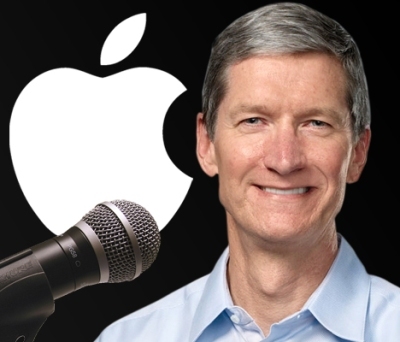 Cook added that the company will continue making acquisitions, and try to keep it quiet. Apple Inc Chief Executive Tim Cook's pay package remained roughly the same in 2013 as in 2012, a recent regulatory filing submitted to the Securities & Exchange Commission (SEC) by the iPhone/iPad-maker revealed. Mr. Cook pocketed $4.25 million in pay and perks in 2013. The package included a base salary of $1.4 million, a bonus of $2.8 million, and a compensation of $52,721 that the company contributed to life insurance premium, holiday cash-out etc. Washington, Dec. 24 : Apple CEO Tim Cook has reportedly hinted to 'big plans' for the coming year in a holiday email to employees. Cook wrote that the company has a lot to look forward to in 2014, including some big plans that the customers are going to love. According to Fox News, the CEO did not elaborate about the big plans, but recent speculations point to the company's prospective projects for next year, including bigger iPhone models, a 12.9-inch iPad, a rumored smartwatch and even an Apple TV set. Tech giant Apple Inc's board of directors is reportedly concerned over the alleged lack of innovation under CEO Tim Cook's leadership. The Cupertino, California-based company has failed to introduce any new revolutionary products since 2012. The company's laptop lineup got a refresh several months back. Some of its members of the board, including Disney chief Robert Iger, Intuit chairman Bill Campbell, J Crew's Millard Drexler and former US vice president Al Gore, are reportedly not pleased with the sluggish pace of innovation at the company. It is believed that one-time stock award worth more than $413 million for Apple Chief Executive Tim Cook will now be partially tied to the performance of the company's shares in the stock market. Mr. Cook has been working in the firm since decades and has been chief operating officer for several years. He has been heading the company since the departure of late Steve Jobs form the most valued technology firm in the world. The share award due to Mr. Cook has now been tied to the share performance following discussions with the company's largest shareholders. London, Feb 28 : Apple's chief executive Tim Cook has acknowledged the growing alarm about the company's struggling stock price, but said the tech giant was working on a pipeline of "great stuff". He told Apple''s annual meeting that no-one enjoyed seeing the share price fall some 35 percent from its September high. The fall has led to calls for Apple to give shareholders some of its 137 billion dollars cash pile. London, Feb 13 : Tech giant Apple's chief executive Tim Cook has said that he has `never been so bullish' about innovation at the company. He, however, stopped short of making any firm commitment. Sydney, Jan 30 : Apple's chief executive Tim Cook has defended his tech giant following the dramatic stock plunge, saying that `the only companies that report better quarters pump oil'. The tech giant''s stock plummeted by 11.3 per cent last week to 455.56 dollars before trading was suspended due to the sharp decline. 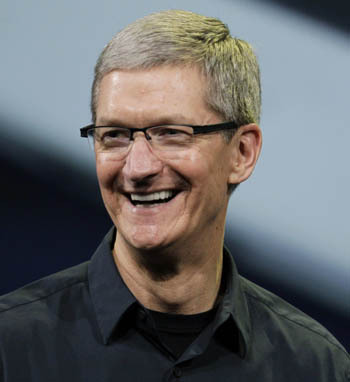 Washington, Jan 9 : Apple boss Tim Cook has made a second visit to China is less than a year, a report has said. According to Bloomberg, Cook met with the country's Ministry of Industry and Information Technology head Miao Wei to discuss China''s developing information and communications industry, innovation trends, and global mobile development, the agency said in a statement on its website. The two men reportedly exchanged views on development in China as well.